I basically used to use Vaseline’s Cocoa Butter lotion because of its strong cocoa scent (which I love) whereas my sis on the other hand uses Vaseline’s Aloe lotion as she cannot stand the strong cocoa scent. I was badly in need of a moisturizer when my cocoa butter got over & I was too lazy to go out to buy one 😛 So I decided to use it that day & from that day onwards I’m addicted to this lotion. 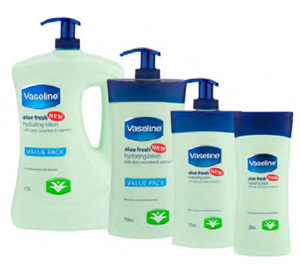 This hydrating body lotion is from ‘Vaseline’s Aloe Fresh’ range which also includes Aloe Fresh Moisturizing Body Gel and Aloe Fresh Protecting Body Lotion (with SPF 15). What Vaseline says about this lotion on its website? As I mentioned I basically tried this just to moisturize but what actually got me hooked to this product is that it works as a great eye makeup remover!! My eyes are extremely sensitive. I have tried many hi brand eye makeup removers somehow everything literally everything stings my eyes. I also tried Rima’s suggestion of using Johnson’s baby wipes, my eyes got stung so bad that they were literally burning for the whole day. I usually don’t try moisturizers for removing my makeup but I don’t know how I ended up trying this to remove some stubborn eyeliner & it was gone in just swipe. A very small quantity (almost a drop) of this lotion works wonders with removing the entire eye makeup (be it heavy or light). I can proudly say now that this is my HG eye makeup remover!! What I like about Vaseline’s Aloe Fresh Hydrating Body Lotion? The main ingredients:- cucumber & aloe which are said to be amongst the best for the skin. My sister has the most extreme driest of driest skin (be it winters or summers) & it works as a great moisturizer for her dry skin. The cucumber scent is fresh & very mild making it nice to use for summers. This is a great product especially if you are sensitive to certain smells. Does not feel greasy or sticky on the skin at all. It gets absorbed by my skin quickly unlike other lotions which take ages to absorb yet it keeps it hydrated. It’s an extremely light lotion so you can layer your sunscreen & other products over it easily. As mentioned above works as a great eye makeup remover. I think $2 for a 400 ml or $4 for a 600 ml is pretty cheap!! Comes in different packaging & sizes. It comes in a travel size so you can try the product before actually purchasing a regular or the larger bottle of this lotion. It also comes in a pump, tube & a squeezing bottle form so you can get it in whatever form you prefer using it in. I once suffered from a really bad rash, I applied this lotion. Not only did it clear up the rash after a while but also left a cool feeling which was very much appreciated at least at that point of time. 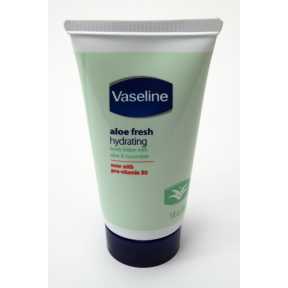 What I don’t like about Vaseline’s Aloe Fresh Hydrating Body Lotion? I wish they would have reformulated this lotion itself with SPF instead of creating another protecting lotion with SPF. Because of its extremely light nature it’s not quite appropriate for winters where you would probably require a heavy moisturizing lotion. Contains Parabens & loads of chemicals!! Definitely only because it works for my eyes better than for my skin!! I totally like the looks of it.Cucumber & aloe is my kind of thing. Would buy the entire aloe fresh line if so..
yes we do get the aloe and cucumber vaseline lotion in India but haven’t seen the gel version..I too love the lotion..it works very well during the hot and humid months of Indian summer. I have oily skin myself but have never felt anything but nice oil free moisturising with this.Though i dnt use it on my face. more like a body lotion. And the smell also makes me feel fresh after a nice bath. I’ve been using it for a very long time and can’t do without it in Summers. Not just summers but most of the year except fro Autumn and Winters. i know its the same for me i prefer heavy moisturizing lotions. Try the cocoa butter i felt that was heavier & better moisturizing than this aloe one. i get it my excitement had reached the same level when i got it !! yeh you can use it but the hair of the tbs rounds will stick on the attachment more so it will be a pain to take it out i would suggest you to wet the rounds from both sides then put your normal face wash on the front side. in any case if you can do get other refills too. i cannot get hold of the different varieties of refill just the normal deep cleansing one. I suppose others might work better. oh btw isnt it too late for you to be gone to bed ?? i love the cocoa butter myself 🙂 haven’t heard of the night renewal one will check that out.